The Real-Time Controller of TMT’s Narrow Field InfraRed Adaptive Optics System (NFIRAOS) successfully passed its final design review and is ready to proceed to the fabrication phase, which is expected to last approximately four years. The first-light state-of-the-art adaptive optics (AO) system for TMT, NFIRAOS, will provide diffraction limited optical performance to its client instrument, IRIS, in the near infrared over an extended field of view, and a large portion of the sky. 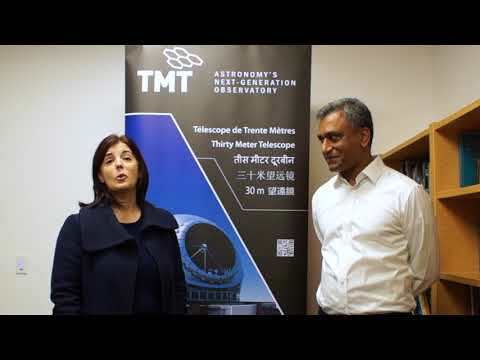 The whole system, combined with the 30-meter aperture of the TMT, will allow the international astronomical community to understand our Galaxy and the Universe at a new unprecedented level. A critical component, the NFIRAOS Real-Time Controller (NRTC), is a high-performance real-time computer that processes over 35,000 measurements from six high-order laser guide star wavefront sensors (LGS WFS), one natural guide star pyramid wavefront sensor (PWFS) within NFIRAOS, and three low-order on-instrument wavefront sensors (OIWFS) in IRIS. It computes within a millisecond time scale the commands of two deformable mirrors for a total of 7,500 actuator commands. The NRTC also performs real-time optimization of its algorithms as atmospheric and observing conditions change, and stores telemetry data to estimate the science Point Spread Function (PSF) for image post-processing. The development of the NRTC requirements and algorithms has been led by the TMT project office. The development of the NRTC algorithms was supported by extensive simulations performed by the TMT AO group. The NRTC works in concert with another high-performance “non real-time” computer, called the “Reconstructor Parameter Generator” (RPG), which is a subsystem of the Adaptive Optics Executive Software (AOESW). The RPG is designed in-house at the TMT project office, and is dedicated to initialize the parameters of the NRTC and to update new control matrices and temporal filter parameters as the atmospheric and observing conditions change. NFIRAOS and the NRTC are Canadian work-share deliverables to the TMT project, falling under the responsibility of the Herzberg Astronomy and Astrophysics (NRC-HAA) division of the National Research Council of Canada in Victoria. After a successful preliminary design review in Oct. 2015, the NRTC entered final design two years ago. The scope of the NRTC final design phase was to mitigate major risks by prototyping the most critical components of the NRTC design architecture and to develop all engineering documents necessary to proceed to the fabrication phase. The architecture is based on 12 off-the-shelf high-performance servers: 6 high-order processing (HOP) servers that convert the 35,000 WFS measurements into 7,500 deformable mirror actuator commands, 1 server dedicated to wavefront corrector control (WCC), 1 server for telemetry engineering display (TED), 2 servers for real-time telemetry storage (RTS), 1 test server (TEST) and 1 spare server (SPARE). Each server includes four high-end Intel Xeon Central Processing Units (CPUs). Connectivity between servers and with all WFSs and deformable mirror electronics is performed through a 10/40 gigabit Ethernet high-speed switch. Prototyping performed during final design has shown that the architecture meets all performance requirements. A simplified block diagram of the NRTC is shown in Figure 1 and Figure 2 illustrates the HOP, WCC, TED and RTS servers and their interfaces. On November 2017, the NRTC team delivered the design documents to the TMT project and the international review panel for final design review (FDR), which was successfully passed on December 8 2017. The NRTC simplified block diagram. The NRTC HOP, WCC, TED and RTS servers and their interface.